Obstacles, walls, and barriers are part of life; a bigger part than most of us would choose on a daily basis. Although, if life only consisted of coasting downhill we would stop enjoying it. We need some things to conquer to keep life interesting. I love and hate rest days. Six days a week I hit the obstacles hard in the gym until my muscles, mind, or both hit failure. One day a week I do nothing in the gym, sleep in if I can, read, write, go for coffee with friends, and let my body recover from the past week of pushing it to the max. How do you say, ‘Grouchy Figure Competitor‘? I miss the endorphins that come from training, my OCD schedule gets thrown off, and honestly I am very depleted from a week of dieting and training. Yes, my husband deserves a gold medal for putting up with me some days. When I take myself out of the normal routine of trying to conquer everything in my life like a Figure Competitor all-star, I suddenly see the world in a whole new light. 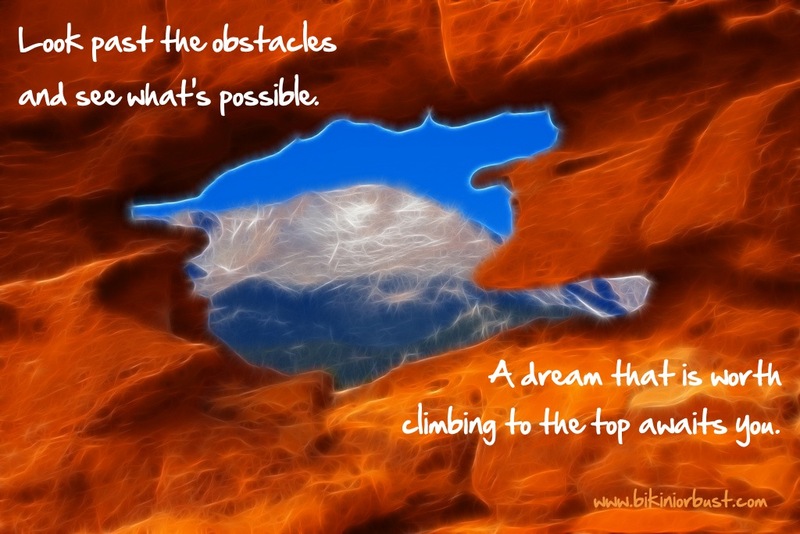 I see cracks and holes in the obstacles and see past the impossible to the possible. Rest days remind me of what I am training for in and out of the gym and what is on the other side. A day of coasting downhill isn’t so bad now and again. In fact, it is downright enjoyable when you lie back and let the wind mess up your hair. What is past your obstacles? What are you fighting for? I have to work hard during the week so that I can impress Peter with my gains each Monday morning. And I have that fat caliper to face! Nothing quite like having your muffin top squished and assessed ever week to give you motivation to eek out a few more sprints on the treadmill.